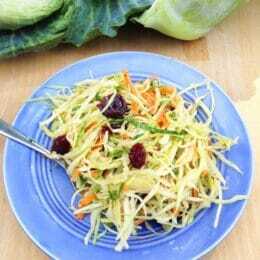 Crunchy, refreshing No-Mayo Coleslaw with Cranberries and Herbs gets loads of flavor from easy homemade vinaigrette and a variety of colorful fruits and veggies. Coleslaw is the foolproof dish I rely on when I need to throw something together quickly for a potluck or backyard party. And this one is my biggest hit! It looks so pretty and tastes so good that my friends and family are always asking for the recipe. Makes me feel pretty darn good. I like to bring this coleslaw to gatherings where I know there’ll be a lot of meat- and grain-based dishes, because it’s a nice foil for richer fare. But it works great for regular old family dinner, too. If you’re making it at home for your family, try pairing it with grilled meats or bean tacos. Yum! Kids don’t always go for salads, but coleslaw, especially when it’s finely-shredded, can be an early exception. Even super-reluctant salad-eaters might try a few shreds, when they see older kids and adults enjoying it. 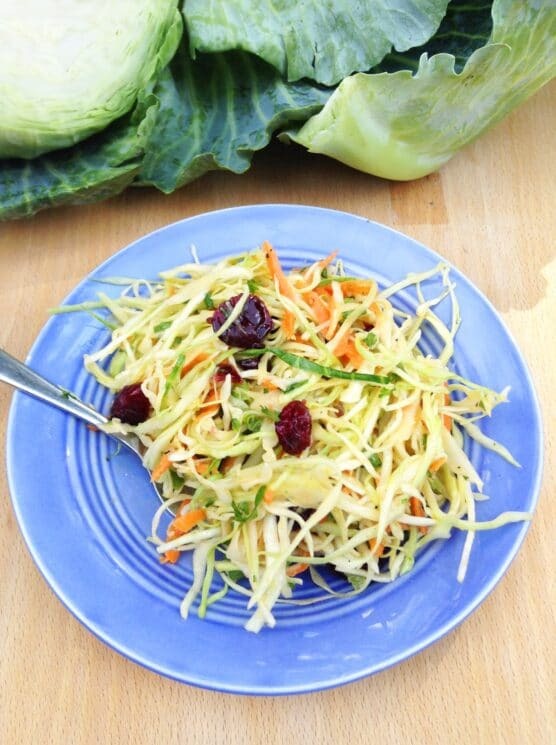 The dried cranberries in our recipe make it an even more inviting slaw for little ones! 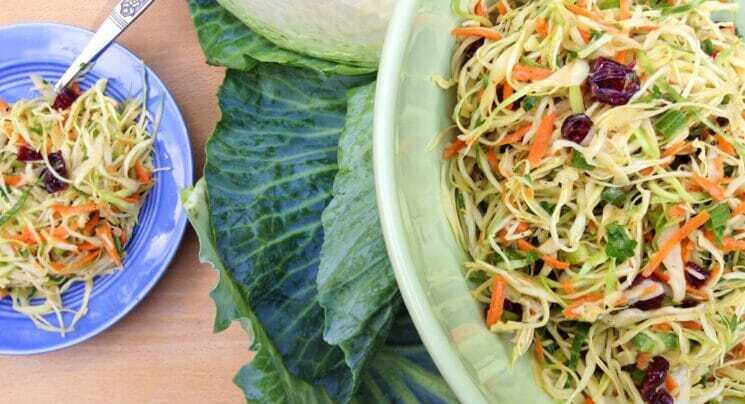 Kids (and grownups) get great nutrition from cabbage, including fiber, Vitamins C and K, and special cancer-preventing compounds called glucosinolates. Obviously, this coleslaw is a no-cook recipe. So it’s perfect for a summer side to a grilled dinner. We use this vegetable slicer to shred the cabbage, and it’s a great tool! It shreds the cabbage to a super fine texture. I sometimes shred the cabbage and grate the carrots a day or two ahead of time and store it in a gallon-sized freezer bag. You could probably also use a bagged coleslaw mix and save even more time. We won’t judge. Here’s another make-ahead tip: mix up the vinaigrette in a mason jar and refrigerate it up to two days in advance. 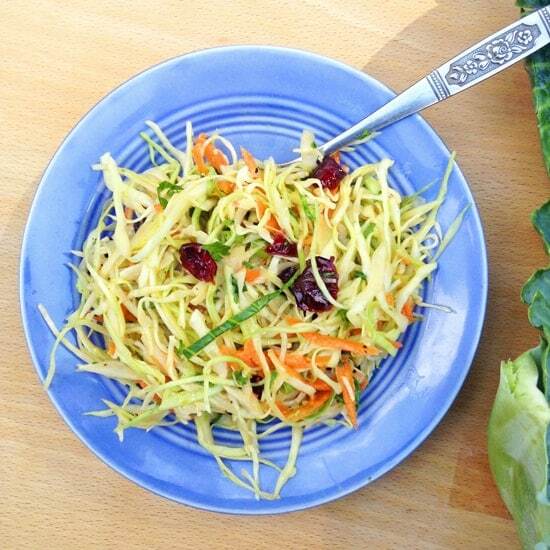 When it’s time to serve your coleslaw, bring the dressing up to room temperature, then pour it over the slaw mixture. Toss to combine, and you’re reading to serve! Eat outside. Enjoy the sunshine! 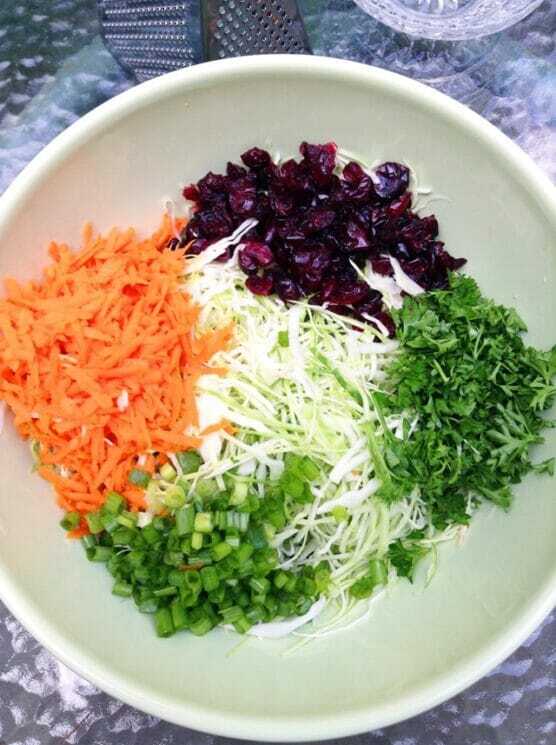 Shred cabbage, grate carrots, and finely chop green onions and parsley. 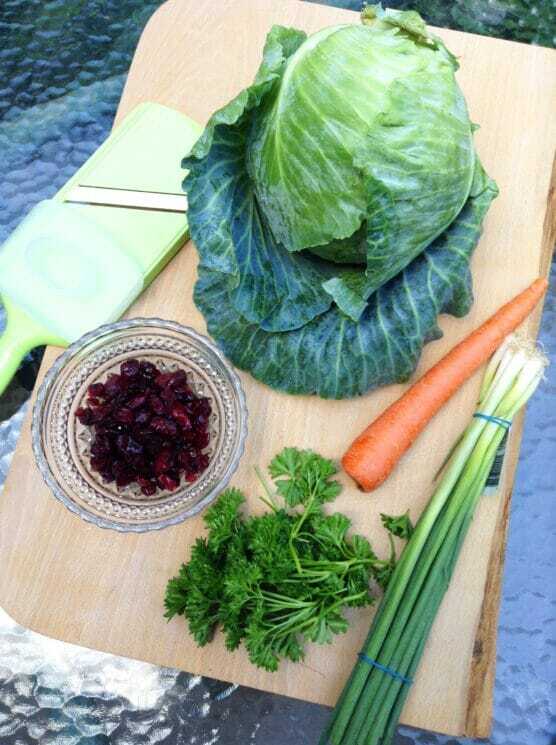 In a large bowl, toss together cabbage, carrots, herbs, and cranberries. In a jar, fork-whisk together dressing ingredients. Pour dressing over vegetable mixture and toss well to combine. Serve immediately or marinate in the refrigerator 30-60 minutes. I don’t see the dressing ingredients listed-am I missing something? LOVE your website!! Hi Jen, sorry for the mixup! We made some big updates to the site last week and a few of the recipes got a little glitchy on us. The dressing ingredients should be back now. Thanks for your patience!